This post has been retired. Please visit the Version 3.01 post. Hey guys. It's been a while since I last posted. I've been around, of course, but I haven't been bothered to make a blog post because there hasn't been much to tell. I was going to write a long farewell letter, but have decided that that's not really necessary since I just finished up an interview that I did for a commenter, Lucero, and his blog. You can read that here. It's got pretty much everything I wanted to say in it and more, and will hopefully give you guys some insight into what was happening behind the scenes (i.e. not much). It's been fun. I'm glad that I took on the task of translating this game, because I've learned so much from it and gotten to know some pretty cool people. I've also fulfilled my long-time dream of making a major contribution to the community. My name will forever be there when you play the twelfth instalment of Fire Emblem. They will speak my name in the songs to come, and when my story turns to legend, and legend to myth, all that will remain will be my name: Agro. In short, I am now immortal. I'm just kidding. I'm not that psychotic. Nor am I a typical FE villain. Katarina: ...Not long now, is it...? It won't be long until we become Altean knights. As you can see, I have the maturity of a ten-year-old. It's been a good year. So long, and thanks for all the donations fish. This blog doesn't seem to deal well with 200+ comments, so use this as an outlet for your hype until Vincent posts the patch. "- Kill them all, bad ending Marth & MU only classic run"
And it doesn't help that the game has to rub it in my face that I used a cheat code to attack and kill my own characters every 3 chapters. No trolling this time around, as I've already posted my farewells; however, I figured a weekly update would be just fair. Besides, the previous post already has way too many replies. Names withheld to protect the innocent. No, we don't have any news about the release date; it still should be out this month. Have a good day. UPDATE: "I'm at like chapter 13, (...) and the glitches were probably a result of cheat codes so :|"
With my test run finished, all that's left for me to do is giving opinions about last minute dialogue changes. So... yeah. All in all, translating this game was an interesting experience and I don't regret spending my time on it. However, this is likely my last big contribution to the Fire Emblem fandom. When I started that Hasha no Tsurugi scanlation four years ago, there were barely any Japanese translators available. Now, we see the rise of youths like Agro and shadowofchaos725; there is no longer a need to rely on someone who doesn't even have English as his first language. That said, I hope you'll enjoy this patch when it's out; it's one of the best games of the series. While Shadow Dragon isn't nearly as good, I suggest playing it while you wait so you can understand the backstory of Heroes of Light and Shadow a little better. Or just play Ys or Trails in the Sky instead. The rest of the team agreed, don't bother them about it. Either way, have fun guys. But I've heard whispers of people who can freely manipulate their dreams and experience it. ... what, you thought I was talking about the patch? Our closed beta goes on, and most of the team has either already reached the middle point of the main story, or is close to doing so. Except Blazer. Remind me why he's still in the team? Oh yeah, we need him to fix the crashes we find. Vincent will be the one to post the patch, so don't get too excited unless you see a blonde Falcom girl at the top of a news post. But it really should happen before our fabled 11/27, unless we run into serious issues. Keep your fingers crossed, etc. Any moment now, the Heroes of Shadow team will be conducting the closed beta test of the translation patch (or not, it looks like I f***ed up the beta. Now you should be glad we had a beta first). I'm not sure if I'll have the chance later, so I'll just give some closing thoughts now. Blazer did, um, stuff and then quit. There's not much to say about him. I kid. Blazer's done a bunch of very important stuff, not least gather the whole team in the first place. They helped to organise the team and the translation process and also got their hands dirty with hacking and various negotiations. TheEnd was our veteran translator, who also worked on the Hasha no Tsurugi and other scanlations. They translated just about everything that wasn't the menu, prologue or the main story branch. Yes, that includes the super-lengthy base conversations. Agro was our rising star translator, somebody who we hadn't heard of before, but they quickly made a name for themself for their reliability and determination. They translated the prologue and main story branch from scratch and did great justice to the Mystery of the Emblem storyline. NomadicTrooperGirl ate all the Japanese graphics and spat out English graphics. We've had 2 graphic editors who did some work then disappeared. NTG did one graphic, vanished for ages, then reappeared and did everything. They're also a graphic editor AND graphic hacker-that's two hard jobs in one! I'm sorry for bunching all you guys together, but you're all important individuals, I swear! I'm talking about Illumio, Martze, Pandorakun and Ryan, our trusty localisation team, who spellchecked, grammar-checked and zapped any zany Engrish lines. I probably also ought to thank myself. I kind of joined the team initially to provide advice and support, but I ended up doing 90% of the menus and then verifying all the text in the game. I'm also apparently the project lead now... but that's probably in name more than anything. And, while not Heroes of Shadow, I'd like to thank Nagato, DarkTwilkitri, Arch, Zak, Zaishi, Vi and Snow (sorry if I forgot anyone!) for providing various levels of assistance. In particular, Nagato is one crazy skilled hacker and if not for them, we wouldn't even have lowercase English symbols in the dialogue. Bonkers, right? Finally, I'd like to thank every Fire Emblem fan who's been keeping up with or anticipating the Fire Emblem 12 translation. Seriously, keep your eyes peeled. The next time I post (I dunno when though...), I can almost guarantee you won't be disappointed! Sorry, I know I'm barely trying here. Something something closed something something beta soon. Here's a question to not be totally boring: How often would you like to see patch releases after the completed patch is finished? While the completed patch should be perfectly playable, it might not be feasible to polish EVERYTHING and we might have missed a few specks here and there. Hi all. Progress is going great, but sadly I've caught myself a cold so I've temporarily halted work. While I have doubts this situation would occur, there's the remote possibility that Nintendo may send us a C&D and I definitely don't want to risk wasting everybody's (and my) efforts and hard work on. So for now, I'll try not to spoil too much, in case we end up on (all?) the gaming news sites like a certain prosecuting attorney. As promised, I'm giving you a cryptic post. Your clue is "The message was already posted." I will not be revealing the answer (but I may provide a clue for this clue if needed), but you're free to guess (or not). Also, I failed my driving test by doing a few silly mistakes, which may or may not have included accidentally running over a dog. Normal progress will recontinue shortly after I've drowned my sorrows with my mage girls and arranged or not arranged said dog's funeral. No animals were hurt during the creation of this blog post. Can you spot any Japanese text in these screenshots? 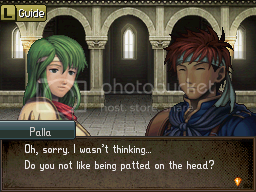 In the meantime, I'm going to apologise for interrupting progress yet again, to mention something curious I spotted in Shadow Dragon, which is slightly related to this game. When NTG was helping me insert the tutorial graphics, she was asking me where file 19 is. The tutorial files are numbered 01 to 38 internally, but there's no 19 and instead a weird gap between 18 and 20. 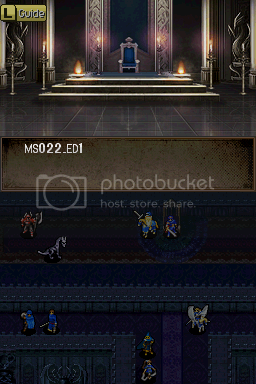 Well it turns out the missing tutorial 19 actually appeared in Shadow Dragon... or didn't appear, would be more accurate. It seems Intelligent Systems were planning to implement the ability to issue orders to units, like in Path of Radiance and Radiant Dawn, but dropped it at the last moment.